The Disaster Artist: Best Friends Make Bad Movies – AiPT! The Room is one of the most beloved movies of the past fifteen years. The 2003 movie is hilariously bad, filled with laughably poor acting, narrative flaws, and production gaffes. The film found a strong cult following and is still screened regularly around the country. Co-star Greg Sestero wrote The Disaster Artist: My Life Inside The Room, the Greatest Bad Movie Ever Made in 2013 which chronicled the making of the movie and his friendship with the writer, director, and star of The Room Tommy Wiseau. A film adaptation premiered in March at South by Southwest and had a full release this month. James Franco stars as Wiseau and is far and away the best part of The Disaster Artist. Franco brings charm to the character. As the audience learns throughout the movie, the real-life Wiseau is not much different from the over-the-top Johnny he played in The Room. The laughs come easy as Wiseau constantly makes (un)intentionally hilarious comments. But Franco’s role is not just played for comedy, however, as Wiseau goes through many struggles while trying to write his magnum opus. Franco plays Wiseau as more than just an oddball; he is someone trying to make his dream come true. Franco’s performance draws the audience in during these scenes. The rest of the cast does a great job but pale in comparison to Franco’s stellar performance. 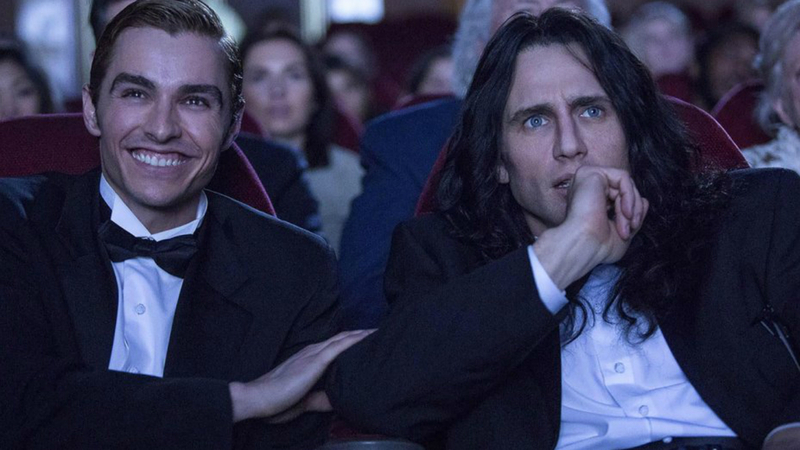 The film adaptation of The Disaster Artist is faithful to the book it is based on and is more about the friendship between Wiseau and Sestero than it is about the making of The Room. The two quickly find out that being successful in Hollywood is easier said than done, and the Franco brothers have a natural chemistry that makes the story of the struggling actors easy to watch. We are not just told the friendship is strong, we witness the bond develop and see the two encourage each other through the difficult times they endure. For all its strong points, The Disaster Artist is not perfect. Most notably, the movie does have some pacing issues. It is never confusing and the acting never suffers, but a friendship is formed and almost ended all while a full movie is filmed then premiers within two hours. The movie spans three years and at times can be a blur. Some seemingly important events are covered in a throwaway line. The movie also has a huge all-star cast (Seth Rogen, Sharon Stone, and Alison Brie are just a few of the names involved) that do not have time to fully develop. In a year of great movies, The Disaster Artist is another good one. James Franco’s portrayal of Tommy Wiseau is one of the better performances of the year. Most importantly, it is not necessary to have seen The Room to enjoy The Disaster Artist; this is a good movie that will appeal to almost everyone. The Disaster Artist is a fitting homage to The Room. It highlights what made the movie so beloved along with adding insight to the people behind it.